How is this not a tank? 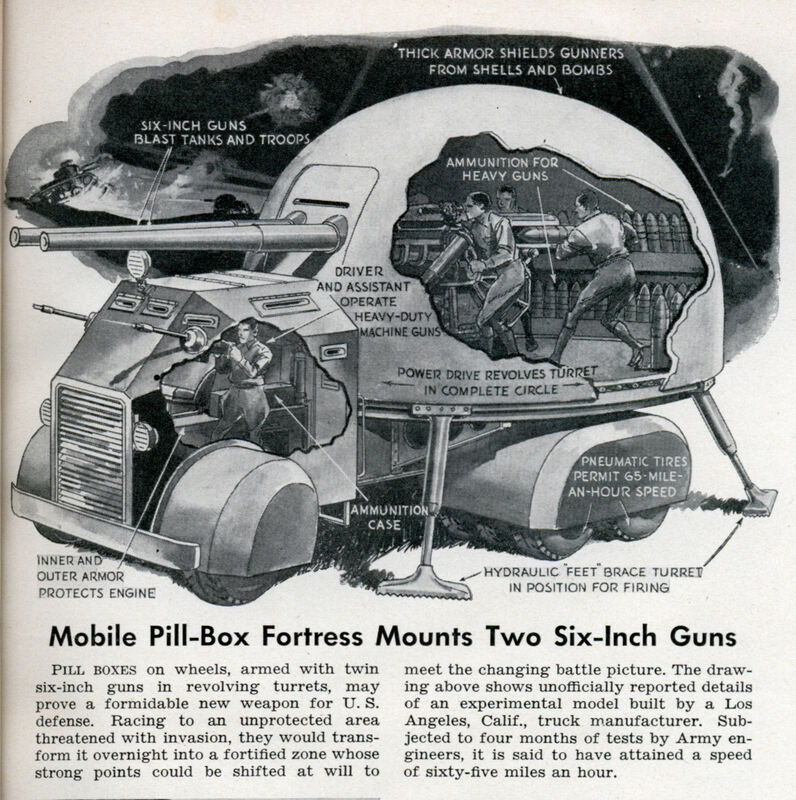 Pill boxes on wheels, armed with twin six-inch guns in revolving turrets, may prove a formidable new weapon for U.S. defense. Racing to an unprotected area threatened with invasion, they would transform it overnight into a fortified zone whose strong points could be shifted at will to meet the changing battle picture. The drawing above shows unofficially reported details of an experimental model built by a Los Angeles, Calif., truck manufacturer. Subjected to four months of tests by Army engineers, it is said to have attained a speed of sixty-five miles an hour. 6 inches is around 152 mm which, while larger than a Main Battle Tank today is not unheard of, as for why this isn’t a tank, well first its on tires, not treads, tanks go on treads, and second, it looks like the guns are designed to be fired only when braced by its “feet” shown in the picture, tanks can fire on the move (the wouldn’t be much good without that ability really), so this is just what it says it is, a mobile pill box. Oh, and tanks rarely have two main guns. This is a totally worthless idea. Less all terrain mobility than a tank so it can go slightly faster on a road, but then there are the struts, which must be deployed apparently before firing, slowing it down again. An why the double barrels? I think triple or quadruple would be better still. Also, this thing must have a profile the size of a house, way too easy to hit. I’d guess the main difference is intended role. That said, i think it’d probably actually be more like a mobile coffin, in practical use. I wonder who was the truck company? I wonder if it was Crown Coach? I’ve lived in the middle of a 3″ gun (the gun was above my bunk, the magazine was below, and the loader path ran right through our mess.) 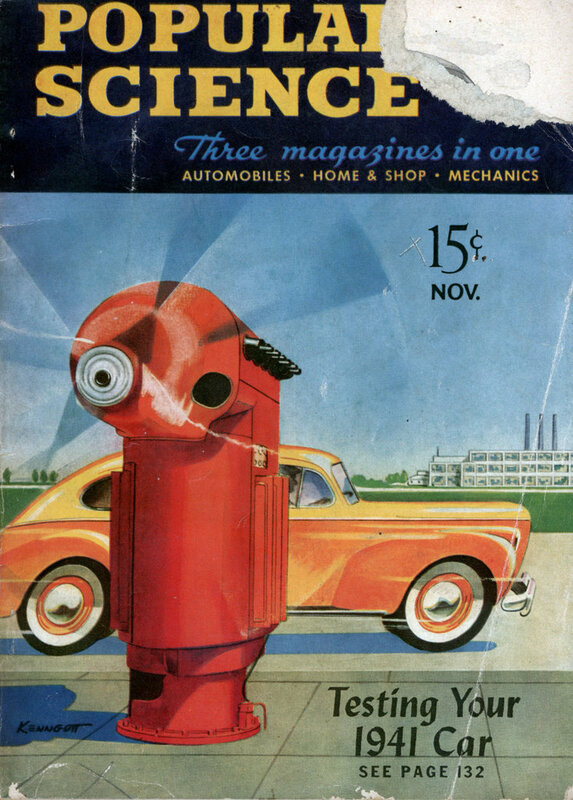 When the 3″/70 was firing both barrels, light bulbs would work their way loose. I find it hard to imagine hydraulic legs would help here, with 6″ guns, even if they did fire must slower than the 100 rounds per minute ours would spit out. Taking the text of the article literally, it was not intended to be used like a tank. They probably would expect it to drive up to a shoreline just outside of naval artillery range and shell troops coming ashore. For that purpose alone it might actually be useful, but other than that it’s worthless. I forgot to mention, one of the things I’ve always liked about these drawings is the total lack of scale considerations.Nnotice the size difference in the man in the driver section and the men in the gun section. Proper armoured-vehicle factories and current-technology guns could definitely be used far more effectively than in these things.